Miss Metro? Hire a Taxi or Sleep on the Street. 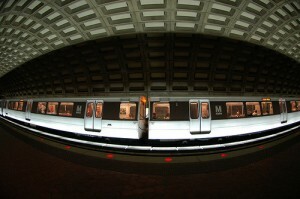 Fisheye view of the red line. 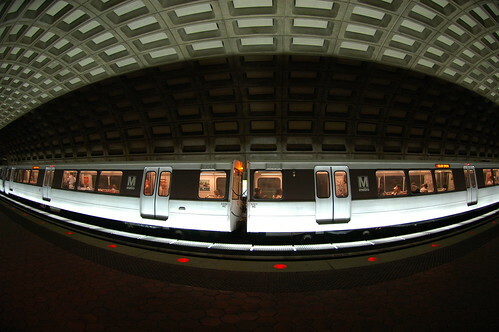 After midnight, Metro is the domain of the young and intoxicated. In this atmosphere, it’s easy to pick out the night commuters, who stand out of the way like hungover club kids might in the morning rush. On the Green Line, Aloh Che, 63, quietly reads a newspaper. His eyes look tired. A patch on his jacket explains why he is out at 1 a.m.: security. His job often ends at midnight. “Once you miss the bus, then you miss the train, then your only alternative is hiring a taxi or sleeping on the street,” he says. He’s done that – slept on the street until Metro started up again. “Three or four times,” he says. Che, a native of Cameroon, works in Bethesda and has worked two shifts this day. By the time he gets home to New Carrollton, the buses will have stopped running, so he will pay a taxi driver $10 to take him the rest of the way.